Ms. Jessica Stanik, a native of Minerva, Ohio, and a D1 student in the College of Dentistry, is the 2018 recipient of the Richard C. Veler, DDS, and Betty G. Veler Dental Scholarship. Chosen for her outstanding academic merit, demonstrated interest in professional service, and exceptional character, Ms. Stanik will receive full, renewable, in-state tuition throughout the remainder of her time in the DDS program. Commenting on the award, Ms. Stanik said, "I am incredibly honored to have been chosen as this year's Veler Scholar. It is my goal to someday provide a level of health care that will impact patients both medically and personally, and receiving this scholarship will afford me the opportunity to make that intent a reality. I am excited to continue my dental educational pathway with this aspiration now more clearly within reach." Dean Patrick Lloyd added his remarks. "When I met with Jessica to tell her she had been selected for this scholarship, she expressed her gratitude and her commitment to making the most of this tremendous opportunity." He added, "I am confident that Jessica will continue to represent our college well. 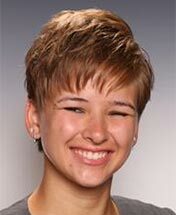 She is in the top of her class, and she is known for her talent, her hard work, and her dedication to the DDS program. I am pleased to welcome her to the special group of students who are benefiting from the Velers' generous gift to our college."